The Public Company Accounting Oversight Board should limit any initial proposal calling for the use or disclosure of Audit Quality Indicators to just a handful of AQIs, and encourage their use as part of a principles-based framework, members of an advisory group told the audit overseer last week. Views differed on the extent to which any disclosure or discussion of particular AQIs should initially be voluntary vs. mandatory, and there seemed to be interest by some in a phased-in approach. The Public Company Accounting Oversight Board should limit any initial proposal calling for the use or disclosure of audit quality indicators to just a handful of AQIs and encourage their use as part of a principles-based framework, members of an advisory group told the PCAOB recently. The remarks came during the second day of a two-day meeting of the PCAOB’s Standing Advisory Group, with SAG members having spent a considerable amount of time in small breakout groups on the first day of the meeting to discuss the PCAOB’s Concept Release on Audit Quality Indicators. SAG members, PCAOB board members and staff were able to reflect on comment letters received on the Concept Release, in addition to their own views. 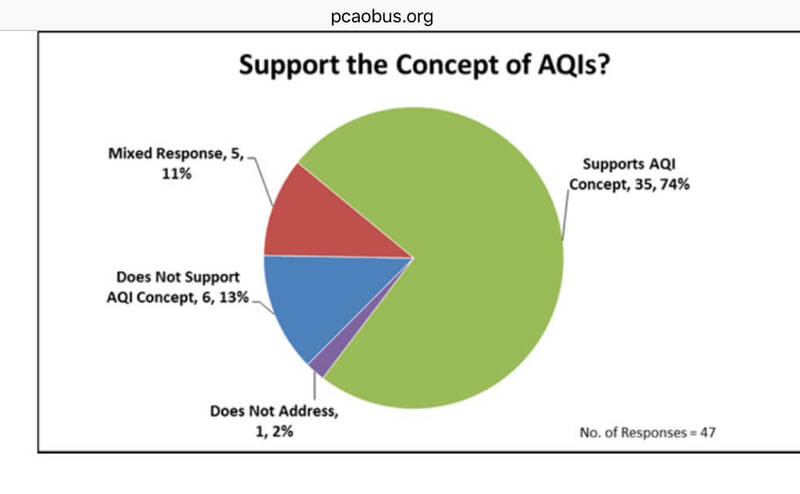 The PCAOB staff’s summary of comment letters on the AQI Concept Release appears in Appendix A to the SAG Briefing Paper. Many SAG members applauded the PCAOB and Greg Jonas, director of the PCAOB’s Office of Research and Analysis in particular, for moving the major (some may say game-changing) project into the common consciousness within a short number of years. While there was a strong view among numerous SAG members that the PCAOB should proceed in moving this project to the next step, there was a wide range of views as to just what that next step should be. industry expertise of audit personnel. Since the concept of AQIs is new and relatively untested (and since there is a need for audit committees and auditors to have flexibility and confidentiality for the discussion of audit quality to be sufficiently robust, and for that conversation to be relevant to their facts and circumstances), a number of SAG members suggested that the PCAOB consider publishing a principles-based framework to drive “best practices” and create a more consistent threshold level of audit quality across all industries and companies. SAG members also suggested the standard-setting board use its formidable “bully pulpit” through podcasts such as their well-received Audit Committee Dialogues and related PCAOB Dialogues podcasts to reinforce voluntary use of AQIs. They also suggested that, at least in the early years, such voluntary use could be more effective and efficient in achieving the PCAOB’s goal of raising audit quality and discussions around audit quality, versus issuing a one-size-fits-all rule with its risk of unintended consequences. Walt Conn Jr., U.S. partner and global head of audit methodology and implementation at KPMG, took this approach one step further. He suggested the PCAOB “issue a thought leadership piece encouraging auditors and audit committees to have dialogue (and) provide examples of AQIs (and) how they are calculated. That thought leadership piece could be updated after a year or two,” during which time constituencies and the PCAOB could discuss their experiences applying AQIs. Asked by PCAOB Chief Auditor Marty Baumann if a requirement for AQIs should be added to the PCAOB’s existing Auditing Standard No. 16 on communications with audit committees, Gallagher said that “bolting on” a requirement for AQIs onto AS 16 would be viewed negatively. SAG member Bob Hirth, chairman of the Committee of Sponsoring Organizations of the Treadway Commission (COSO), a private-sector organization that publishes guidance on internal control, corporate governance and anti-fraud studies, suggested the PCAOB apply its suggested AQIs during its audit firm inspection process. The PCAOB would then be in a position to study actual data to see if there are correlations or “causations” between certain AQIs and audit quality. PCAOB Chief Auditor Marty Baumann called such suggestions “excellent,” with respect to suggestions that the PCAOB apply the AQIs as part of inspectors’ root cause analysis. Another reason some SAG members called for voluntary application of AQIs was so voluntary efforts currently under way, including the transparency reports issued by the large audit firms and voluntary initiatives led by the private-sector Center for Audit Quality, could have more time for feedback and development. There was debate about how useful AQI measures would be to investors, with investors themselves having different views. “The notion of AQIs is a pretty good one for a lot of reasons. You have too many categories (in the Concept Release). I concur with earlier comments to have fewer than the 20-some odd AQIs you’ve got now. “That said, the question is: What is the value of this thing? Any time you force someone to be introspective has value, (but) vis-à-vis making disclosure mandatory − I would be against that. When you create mandatory disclosure, the whole exercise becomes legal boilerplate. I would keep it voluntary. I think you’ll ultimately get better audits out of it versus mandatory. Time to act, but how? Interesting views on whether AQIs should be mandated or voluntary were posited by a number of former regulators and standard-setters, as well as others who currently serve on the SAG. “Having been a standard setter,” said SAG member and former IASB Chairman Sir David Tweedie, “I noticed constituents fall into two categories: Conservatives say, ‘Don’t do it.’ Liberals say, ‘Do it, but not yet.’” Further defining the “not yet” camp, Tweedie, explained, were calls to do more research, conduct field tests, consult with constituents, and re-expose proposals. Referencing whether there was any correlation between AQIs and critical audit matters (or CAMs, the subject of a rule proposal issued by the PCAOB on the “auditor’s reporting model”), Tweedie said it could be helpful to consider, in looking at CAMs such as valuation, what the AQI measures have to do with that. Describing unintended consequences that initially occurred after banking regulators prescribed risk-based capital rules following a banking crisis, Breeden said, “I think this illustrates the problem of a concept: It is impossible to argue audit quality isn’t important, but can you really regulate it, and can you mandate anything that will end up not being counterproductive? “My view,” said Brandon Rees, deputy director of the Office of Investment at the AFL-CIO, “is the problem with voluntary disclosure is that only those issuers that have high-quality audit committees and high-quality audits will benefit from that. It’s the companies that have problems that would benefit the most from mandatory firm-level and engagement-level disclosure. The current status of the AQI project was subsequently summed up by PCAOB Board Member Jay Hanson in remarks at FEI’s Current Financial Reporting Issues Conference.